This month we’re giving away a Kreg Deck Jig as part of our monthly schwag drawings. But here’s a deal you might want to take advantage of JUST IN CASE!!! 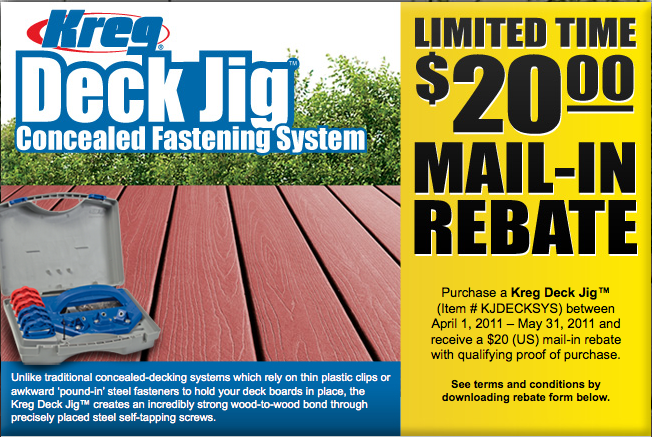 Purchase a Kreg Deck Jig™ (Item # KJDECKSYS) between April 1, 2011 – May 31, 2011 and receive a $20 (US) mail-in rebate with qualifying proof of purchase. To find out more about this great deal on a tool for outdoor projects from decks to picnic tables and benches around the campfire, visit www.kregtool.com/djrebate/ to download the rebate form and see all the details. Of course you could get your name entered for a chance to win the Kreg Deck Jig in this month’s schwag drawing…but why take a chance and miss out on this great deal?